A breathing disorder, often mistaken for asthma, in which a person induces his or her trachea to narrow, causing wheezing or apparent shortness of breath. The person’s oxygen saturation remains normal, but his or her description of the problem and apparent breathing distress may be quite dramatic; in severe instances, the person may have been intubated and placed in intensive care, based purely upon the “drama”—that is, the person’s distressed appearance and audible noises. The extent of medical intervention prompted by this pseudo-asthma can be remarkable. 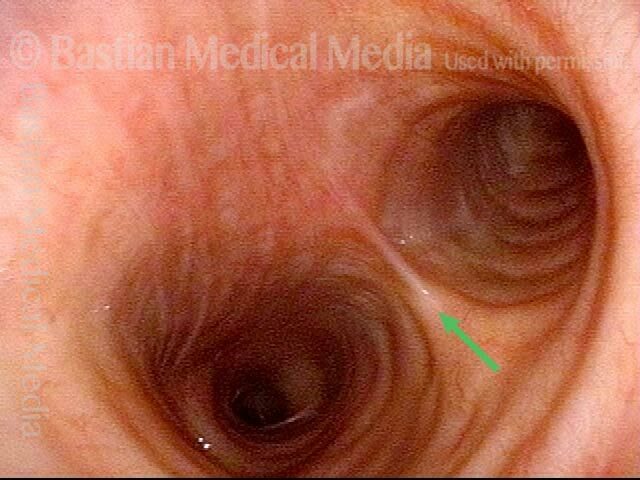 The person’s trachea momentarily narrows or collapses, but unlike with tracheomalacia, this narrowing or collapse is not due to any anatomical or physiological disorder of the person’s trachea. 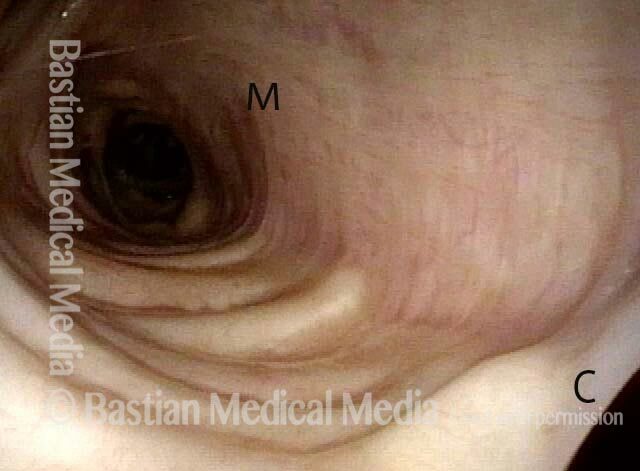 Instead, it can be seen as an added capability of the trachea: an unusual, heightened capability of the membranous tracheal wall to flex inward and decrease the caliber of the “pipe.” A person whose trachea has this added capability may figure out how, with inconspicuous excessive expiratory effort—a sort of semi-Valsalva maneuver that isn’t evident to observers—to induce this tracheal or tracheobronchial collapse that creates the wheezing heard by family, friends, or co-workers. Often, this upper airway wheezing ability can be just a personal quirk (like double-jointedness) that has no particular significance to the person’s life; think of a “wheezy laugh.” Such a case would not be a nonorganic breathing disorder case. In extreme cases, however, a person may begin to use this wheezing ability to masquerade (perhaps sub-consciously) as having asthma, in order to achieve some kind of “secondary gain”; this added element puts a case into the category of a nonorganic breathing disorder. Sometimes, the person does have asthma, but is able to markedly amplify the asthma’s apparent severity by overlaying on it this dramatic nonorganic upper airway wheezing ability. The wheezing is louder over the manubrium (uppermost part of the sternum) than over the peripheral lung fields. There is a surprising incongruity between, on the one hand, the person’s apparent distress and, on the other hand, his or her objective findings, such as oxygen saturation, pulmonary function tests, blood gas measurement, and so forth. Potent treatments for asthma do not seem to diminish or abolish the wheezing. There appears to be some kind of “secondary gain” (mentioned above). Examples of secondary gain might be simple increased attention from family, healthcare workers, and so forth, or else avoidance of school or work, or an enhancement of the chance of winning a lawsuit, or release from responsibility for losing a competitive race, or the ability to manipulate others who have high levels of empathy combined with low levels of discernment of others’ motivations. 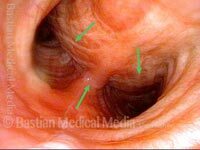 This man has expiratory wheezing but the question of vocal cord dysfunction (which usually causes inspiratory noise) has been raised. The actual problem is not laryngeal, but instead functional/ non-organic large airway wheezing. 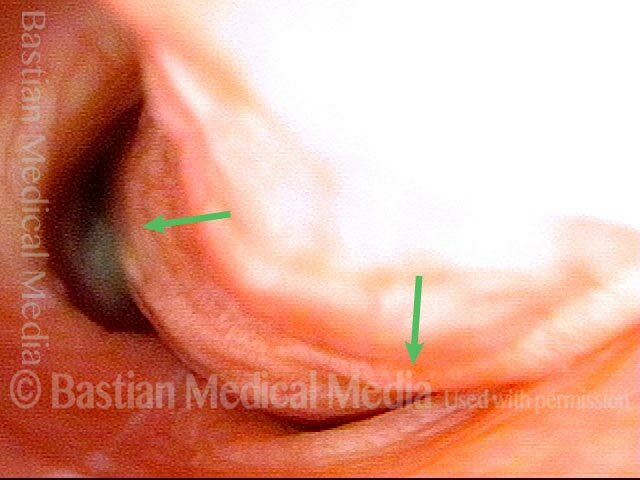 Here is a view of most of trachea during inspiration. 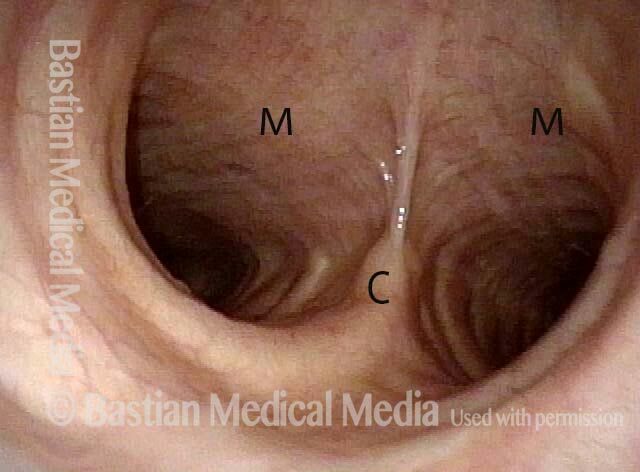 “M” designates membranous portion in all photos of this series. When asked to exhale forcibly, marked wheezing is heard. 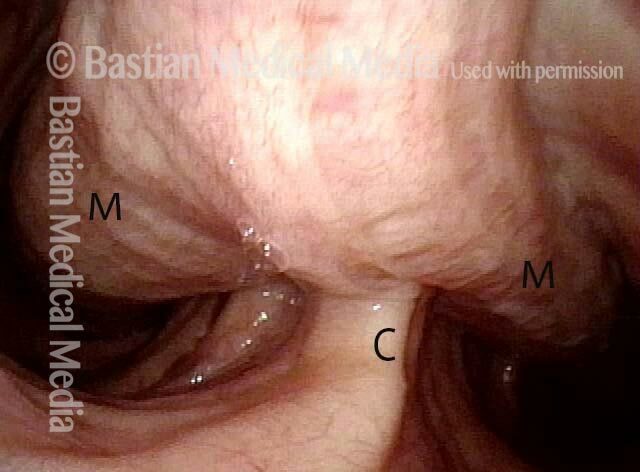 The membranous trachea invaginates but does not appreciably narrow the lumen caliber. Wheezing is NOT from this level of the trachea. Deeper in, with carina in clear view during inspiration (marked with “C” in this and subsequent photos). 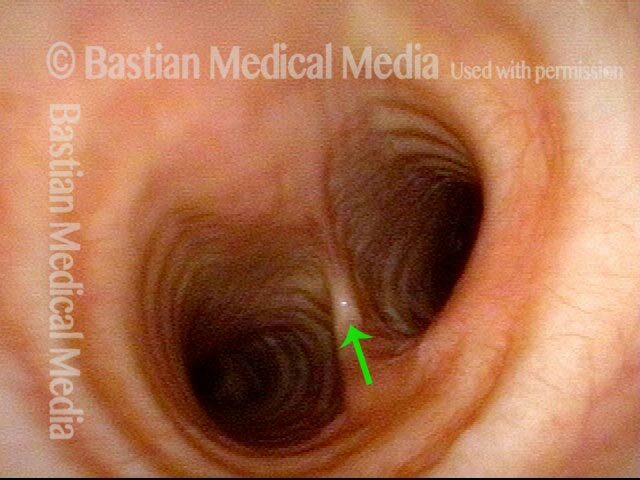 With forced expiration, the membranous trachea bulges inward and mostly obscures the carina, but the degree of luminal narrowing is still not sufficient to create significant wheezing at this level. Now viewing even farther down, into the right mainstem bronchus, with base of the carina still barely in view (again at “C”). 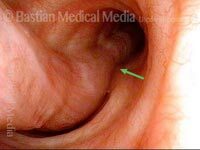 The membranous right mainstem bronchus bulges inward and leaves only a small dark crescent of space for out-rushing air. THIS is where the wheezing is originating. Wheezing noises from distal trachea and mainstem bronchi will be transmitted to the lungfields better and more closely mimic asthma, as compared with wheezing that originates in the trachea; which is much louder on auscultation at the sternal notch than in the peripheral lungfields.